With the return of Super League upon us, to coincide with the imminent increase of pie sales and the M62’s carbon footprint we have decided to have a butchers at Wigan Warriors’ effort for 2014. Manufactured by the ever reliable ISC the first thing (well the only thing actually) that strikes you about this garb is the hideous diagonal striped pattern which has replaced the traditional hoops. It’s reminiscent of the shittest tie your Geography teacher could have unearthed in his annual trip to Matalan, or perhaps one of those dreadful bedlinen sets that all mothers bought for their witheringly ungrateful sons from the Littlewoods catalogue in about 1987 – either way, it’s a mess. Thankfully, the main Houses For Homes sponsor brings some welcome relief from the diagonal gash (er we mean slash, actually… do we? ), which dominates the front. 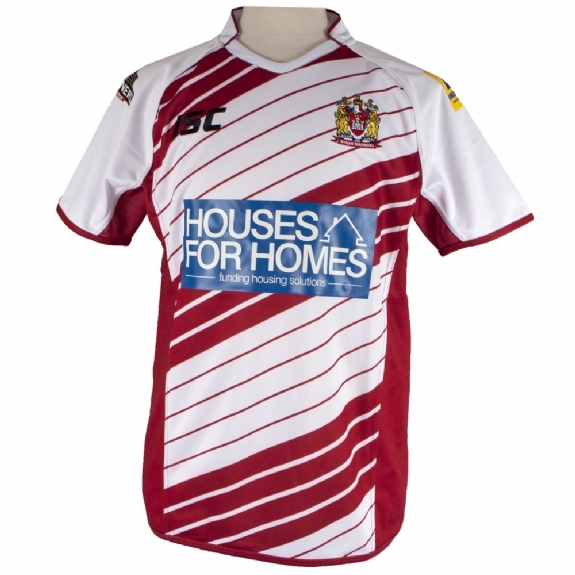 We have to admit the back of the shirt is far better, as ISC have opted for a very simplistic white with red sides and actually looks rather nice if not ironically a little like a St Helens shirt! In essence this little number is a far superior shirt from the home jersey but that was never going to be difficult…Common sense has prevailed and it is at least adorned with horizontal stripes – what a novel idea! – and is much less vom-inducing as a result. Having said that, all is not rosy in this particular part of Lancashire. While we have to admit we are fans of the ‘slimming’ black panels on the side and the stylish aforementioned white stripes adorning the front and back of the shirt, the main beef we have with this garment is the colour. Purple? Honestly? We understand the necessity for an outlandish away shirt (and Wigan have had a few) but it has to be said purple is a gamble.After all, traditionally, the only people who can pull purple off are goths, wizards and Prince, and we’re not sure The Artist is a Wigan fan, to be honest.